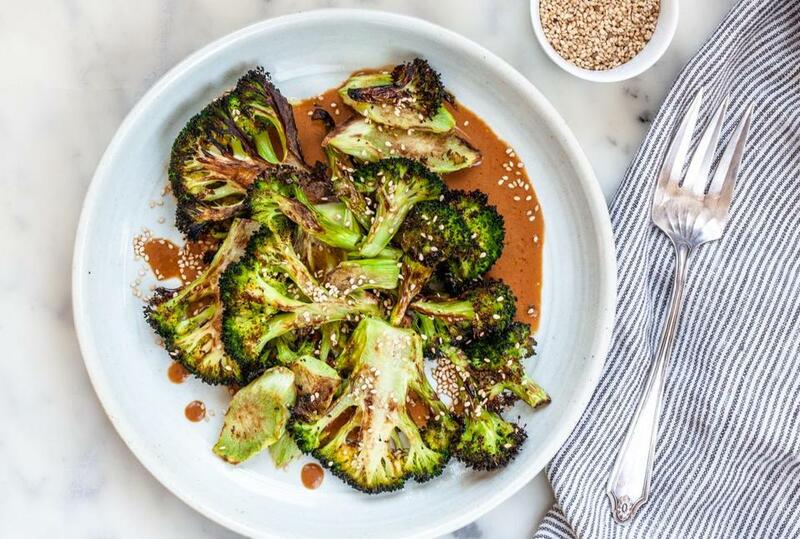 Charred broccoli is unexpectedly good — a broiler transforms the green florets — so suppress your yawn when we tell you you’ll fall in love with this recipe. Blanch the broccoli in boiling water for just two minutes before sending it to the broiler. Don’t ignore the broccoli stems. Once you peel them (use a small paring knife or a rotary vegetable peeler), they become tender and sweet. Begin with three heads of broccoli because the broiler shrinks it while it chars. Serve with miso dressing and sesame seeds for an extra flavor boost; add a bowl of rice. 1. In a blender combine the water, vinegar, miso, soy sauce, honey, ginger, olive oil, and sesame oil. 1. Bring a large pot of salted water to a boil. Line a rimmed baking sheet with a paper towel. 2. Cut across the broccoli bunches about 1-inch below the florets to separate the stems from the tops. Cut the stems on the diagonal into ¼-inch-thick slices. Slice the broccoli tops, including the attached stems, into ½-inch-thick steaks. 3. Cook the broccoli stems, steaks, and any loose broccoli florets in the boiling water for 2 minutes. Remove with a slotted spoon and drain on the baking sheet. Pat them dry with paper towels. 4. Set an oven rack 2 to 3 inches from the broiler and turn on the broiler. 5. Lift up the paper towel and tumble the broccoli onto the baking sheet. Spread it on the baking sheet and drizzle it with the olive oil. Sprinkle with salt and pepper.